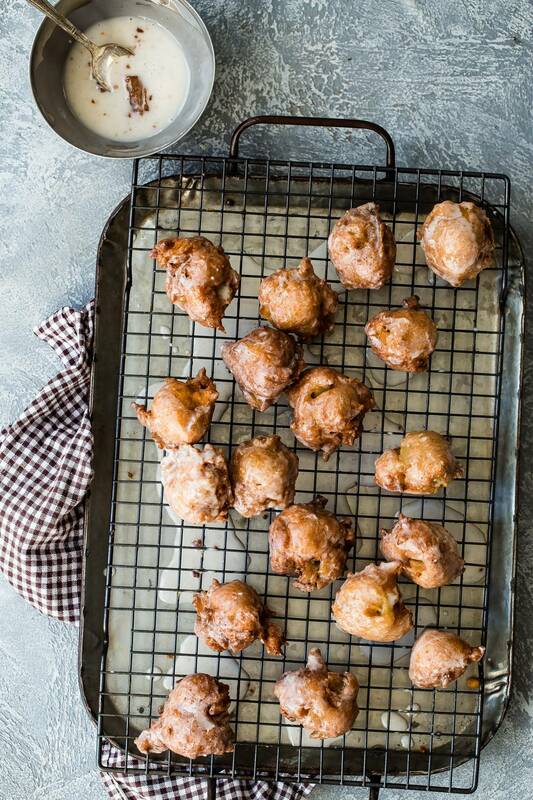 These pumpkin spice apple fritters are tossed in a sweet vanilla glaze! Serve these with a hot cup of coffee on the weekend for maximum yumminess! There are so many reasons to love these apple fritters, like being easy to make, no yeast involved and the taste! I tend to stay away from frying things just because it can get messy and the kitchen might smell for days. But sometimes it’s so worth it, even with the hot oil burns I always seem to get no matter how many years experience I have cooking. 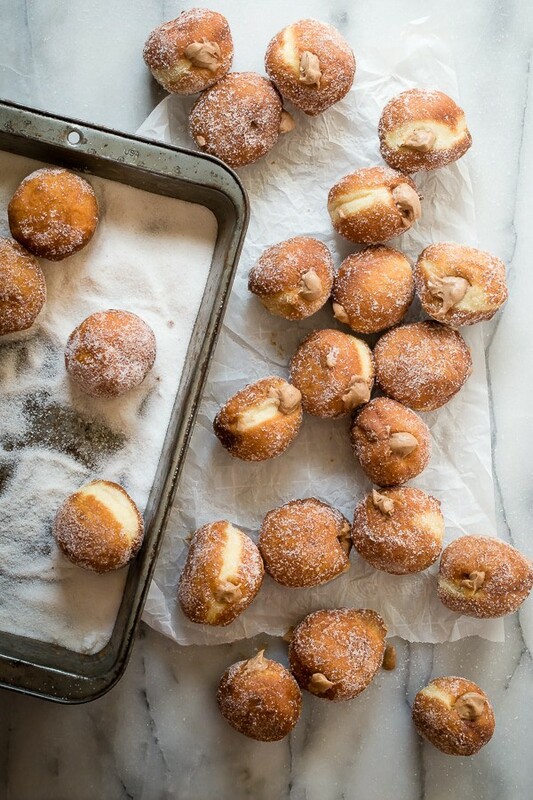 Are apple fritters just like doughnuts? Yes, they are, and that’s a good thing right! They have the same texture as a fried doughnut but this kind doesn’t require any yeast in the dough. It has the consistency of a pancake batter which you scoop up and drop into the hot oil. Don’t worry about the random shapes, being imperfect is what fritters are all about. What if I don’t want to use the glaze? Easy! 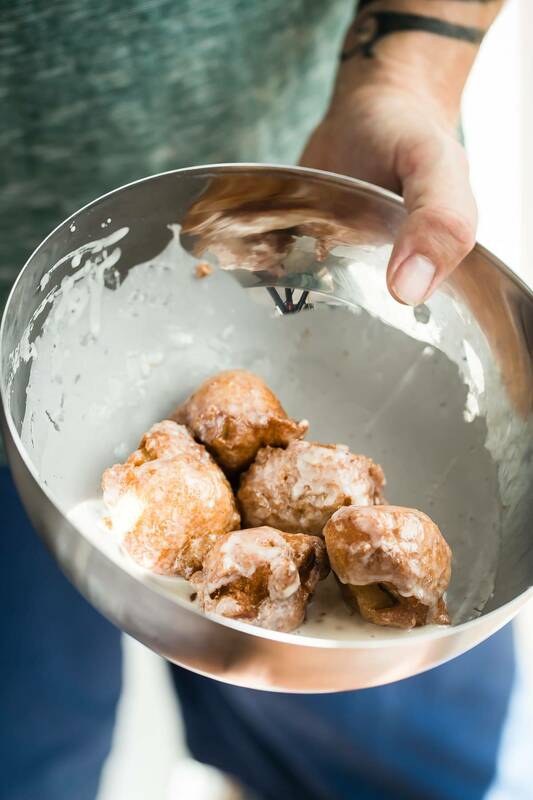 Mix some regular sugar with cinnamon and toss the warm apple fritters in the sugar. Or dust heavily with powdered sugar for a similar look and taste as a southern style beignet. 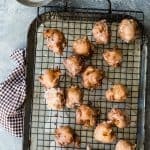 How do I make these apple fritters? Most apple fritter recipes will tell you just to add diced apples to the batter. Apples are crunchy and I love them. But when it comes to dessert I like my apples soft and sweet. So before I even make the batter for these apple fritters, I cook them for five minutes in butter and brown sugar just to get them nice and caramelized. 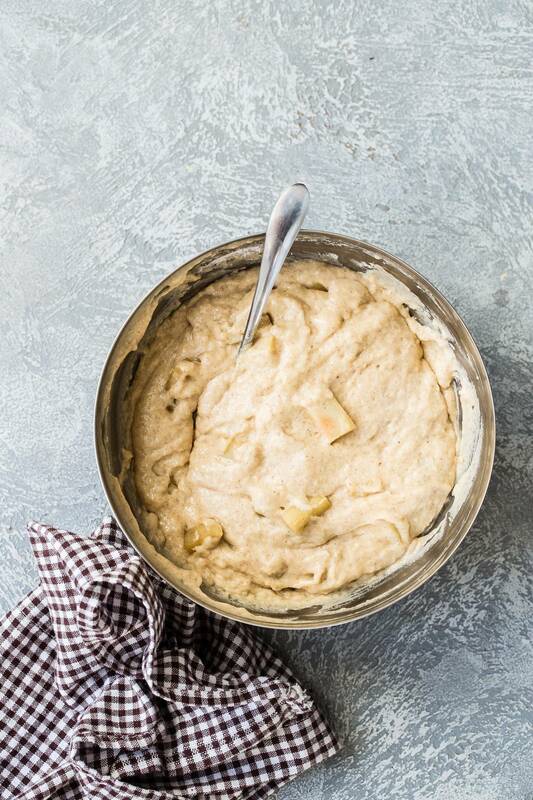 So much better than just raw chunks of apple in your fritters! Cooking the apple fritters in the oil. 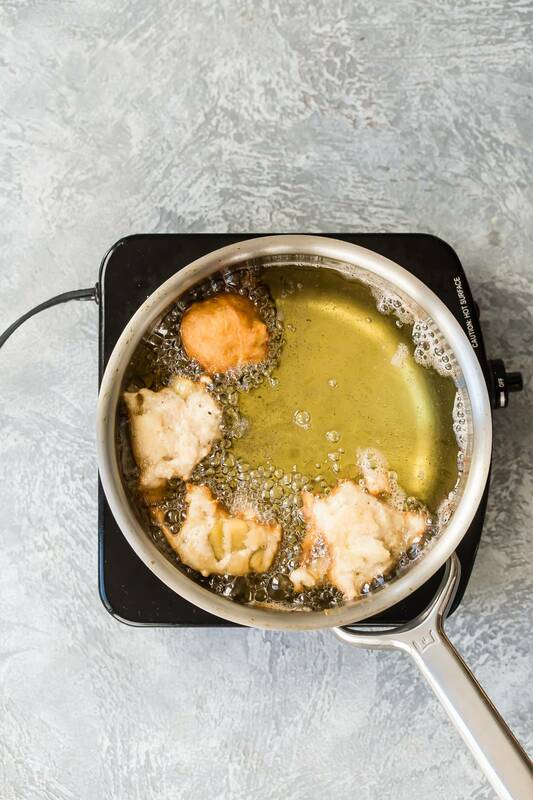 Make sure your oil reaches 375 degrees for frying. You’ll need a thermometer for this, it’s a great kitchen tool to have even if you don’t use it that often. 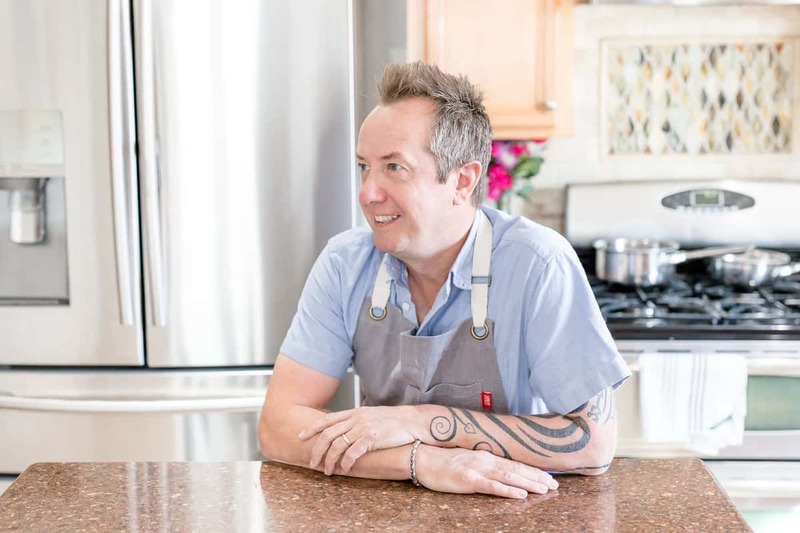 An easy way to drop the batter into the oil is to hold a tablespoon in each hand. Take a scoop of batter with one of the spoons and push it into the oil with the other spoon. Don’t overcrowd the oil or the apple fritters will start to stick to each other and the temperature of the oil will drop quicker making it harder to get that crispy golden brown color on the outside. Making the glaze for the apple fritters. Usually, when we make a powdered sugar glaze it has to be on the thick side so that it doesn’t run off the cookie or whatever it is we’re frosting. But for the fritters, we want it to be nice and thin. Think Krispy Kreme Doughnuts and how the glaze is on their original glazed doughnut. Mix the powdered sugar with the milk and pumpkin spice. Add a few drops of vanilla and it’s ready for the fritters. Everything about making these apple fritters is kind of haphazard, they don’t need to look perfect because they already taste amazing! 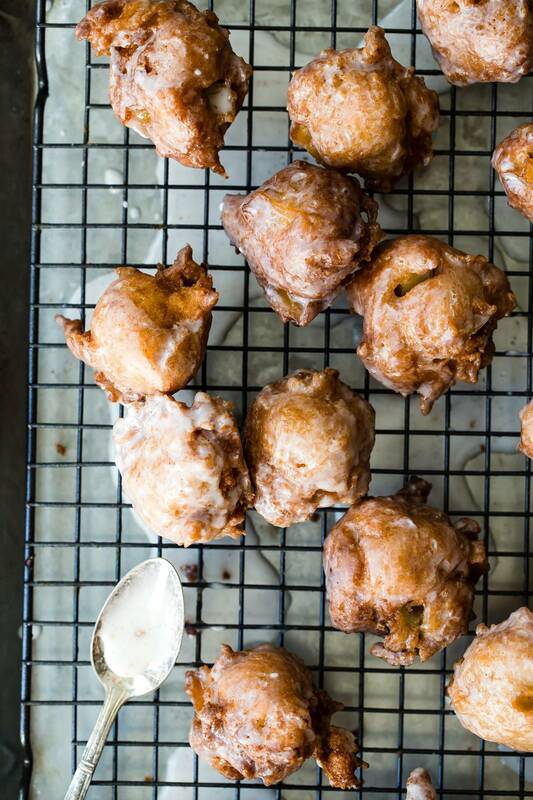 Let me know if you make these apple fritters! If you do tag me on Instagram and I’ll add it to my stories. 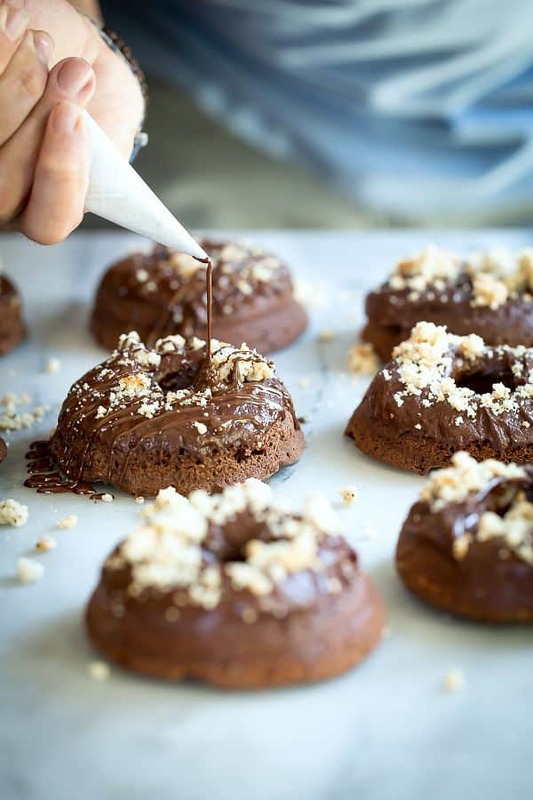 Check out these other doughnut recipes you might also love!! Peel and core the apple then dice into small squares. Heat the oil until 375 degrees. In a large pan, heat the apples, butter and brown sugar unto the liquid almost looks like a caramel sauce. Set aside. In a bowl combine the flour, sugar, baking powder and spice. In another bowl whisk the eggs, milk, vanilla and melted butter. Slowly add the wet ingredients to the flour and stir gently. Add the apples from the pan and combine. Scoop up about a tablespoon of the batter and gently drop it into the hot oil. Fry on one side for almost one minute then flip the fritters over to repeat on the other side. Once the fritters are done, place them on some paper towels to absorb the grease. Make the glaze and toss the fritters until coated. Bring on the fritters, these look delicious! Thanks for all the great tips!! These fritters were amazing! I know exactly who I want to make these for! I have some apple fritter lovers in my house, so these are perfect for this time of year! 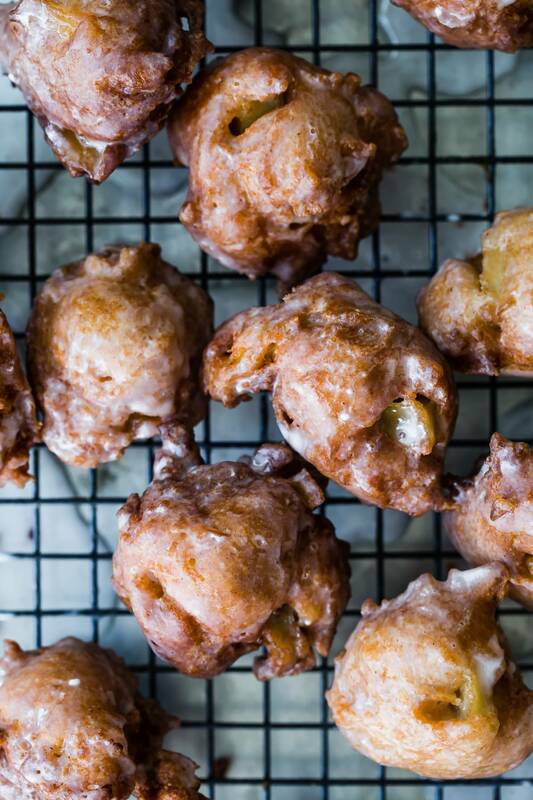 Apple fritters were a big treat when I was a kid but they were never homemade. I love the addition of the pumpkin spice flavor for this glaze!